Ever since 1929 physicists have known that the Universe is expanding. In 1990s observations suggested that the rate at which it does so is accelerating, a result which won its authors the 2001 Nobel Prize in Physics. Both of these discoveries came as a shock at the time they were made. Now it seems physicists might have a to backtrack a little: a new study appears to suggest that the Universe's expansion isn't accelerating quite as rapidly as was previously thought. The main tool in the discovery that the expansion is accelerating was a particular type of explosion that can blow up stars, known as a type Ia supernova. "The idea [...] is that type Ia supernovae happen to be the same brightness," explains Peter A. Milne, an astronomer at the University of Arizona who co-authored the new study. "They all end up pretty similar when they explode." These supernovae can therefore serve as standard candles: by observing their apparent brightness and comparing it to what you know to be their intrinsic brightness, you can work out how far away they occurred. Knowing the distance and the speed at which light travels, you can then work out how long ago the explosions happened. As the light from these cosmic beacons travels towards us, it is itself affected by the Universe's expansion. The wavelength of the light is stretched, shifting it to the red end of the spectrum. By measuring this redshift, you can work out how much the Universe has expanded since the light was emitted by the supernova. If you manage to observe many type Ia supernovae at a range of distances, you can put together the recent expansion history of the Universe. Many people think of the expansion of the Universe like an explosion, so it must have a centre and there must be an edge. But there is no centre of the Universe and there is no edge of expansion. The easy case to visualise is that of an infinite Universe. Think of a two-dimensional Universe, a rubber sheet that goes on infinitely in each direction. If this infinite sheet was being stretched, then no matter where you stood on it, you'd see everything expanding away from you. You could draw a circle around yourself which describes the edge of your observable universe — the radius of that circle would be the distance that light has been able to travel since the sheet started expanding. It's not that there is no sheet beyond the boundary of that circle, it's just that we can't see it yet. But what if the Universe is finite? Imagine the surface of a balloon, which is finite, but has no edge. If we inflate a balloon marked with crosses, all the crosses move away from each other as the balloon expands. The centre of the expansion does not lie on the balloon so it's not part of the balloon Universe. The new study casts doubt on previous consensus by showing that type Ia supernovae might not be as uniform as was thought. "We found that the differences [between supernovae] are not random, but lead to separating Ia supernovae into two groups, where the group that is in the minority near us are in the majority at large distances — and thus when the Universe was younger," says Milne. "There are different populations out there, and they have not been recognised. The big assumption has been that as you go from near to far, type Ia supernovae are the same. That doesn't appear to be the case." As a result it seems that the acceleration of the Universe may have to be revised downwards. Milne and his co-authors (Ryan J. Foley of the University of Illinois at Urbana-Champaign, Peter J. 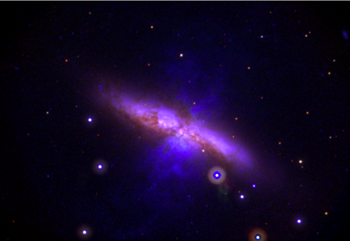 Brown at Texas A&M University and Gautham Narayan of the National Optical Astronomy Observatory in Tucson) observed a large sample of type Ia supernovae, both in ultraviolet light and in visible light. For their study they combined observations made by the Hubble Space Telescope with those made by NASA's Swift satellite. The data collected with Swift were particularly important because the differences between the two supernova groups — slight shifts towards the red or the blue spectrum — are only very subtle in visible light, which had been used to detect type Ia supernovae previously. They became obvious only through Swift's dedicated follow-up observations in the ultraviolet. "The realisation that there were two groups of type Ia supernovae started with Swift data," Milne said. "Then we went through other datasets to see if we see the same. And we found the trend to be present in all the other datasets." When physicists first discovered that the expansion of the Universe is speeding up they needed to come up with an explanation as to why. This led to the notion of dark energy, a mysterious form of energy that drives things apart. "We're proposing that our data suggest there might be less dark energy than textbook knowledge, but we can't put a number on it," says Milne. "Until our paper, the two populations of supernovae were treated as the same population. To get that final answer, you need to do all that work again, separately for [the two] populations." More data will have to be collected before physicists can assess exactly what the new result means for dark energy. This article has been adapted from a University of Arizona news release by Daniel Stolte. Why was it believed in the first place that !a supernovae almost always produce the same amount of light, so if you know how bright it is, you can tell how far away it is? This was published in August last year, apparently even before the emergence of discoveries resulting from studying those 1a UV emissions described in the above article.